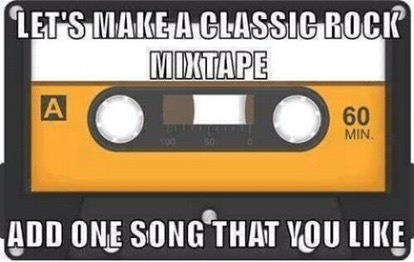 What’s one song you will add to our Mix Tape? Ours is listed below. Add yours – let’s pawty! Barks! You know sometimes our humans are weird and forgetful. I get that. Really I do. But my mom forgetting about sweet little moi? That’s just disgraceful. In fact, let me tell you the story and then you tell me what you think. Mom/dad went out the other night and came home late. Mom goes straight to the kitchen to do her nightly ritual things – set the microwave for dad’s lunch the next day, fixing the medicines for the next day, setting the coffee maker for the morning, making sure all of us anipals have food and fresh water, etc. Also at night, we anipals all get bedtime treats. You know just a little something to hold us over until the morning so our tum-tum’s don’t growl. Well mom gave Hemi his cat chews. Mom gave Bacon his strawberry. And then mom walked to the bathroom. Hold up mom – wait a minute. You forgot me. I chased her to the bedroom and watched her as she got ready for bed. I jumped on the bed and kept licking my lips trying to tell her hello – moi – moi – you forgot moi! Finally when she went to the bathroom to wash her face and brush her teeth, it dawns on her. We finally have a winner! How could she forget about me? Does that ever happen to you my friends? Hello sweet friends – we finally made it to Friday. Thank goodness for that! I just had to share my picture from this week with you. This is me laying with mom cuddling me. See Mr. Elephant? That’s my new toy that mom bought for me. He’s just my size. He still squeaks and I keep dragging him around the house by his nose. It’s perfect. Can you see my eyes in this picture? Barks with puppy laughter. That’s what I keep telling mom too. I need a haircut. I think I need a spa day for sure. It’s been a long week here at the Hotel Thompson. We’ve been having weird weather. You know the kind that brings out all of your doggy senses. So you get up/down all through the night to check things out because you know you gotta protect the humans. Bacon and Hemi don’t seem to mind the weather changes. It drives me crazy and makes my inner Yorkie come out. So here I am all tuckered out on my ottoman in the living room in front of the fireplace. I was bushed from getting up/down the night before. Speaking of which, I have to share a little funny with you. I can jump. Don’t let anyone tell you anything different. Mom/dad’s bed in their bedroom is now obstacle for me. I can run and jump on that thing anytime I want. But I found something so much better these days. In fact, daddy didn’t believe mom when she told him until he heard it himself. Here it goes…. mom/dad sleeping so hard in a deep sleep, I jump down to check the perimeter. When I come back, I waddle over to mom’s side of the bed. I will perch up on the side where she lays facing the wall and growl at her. I call her my elevator. With enough growling she wakes up and lifts me in the bed with her. Of course she fusses but I know she doesn’t mind. I call her my personal elevator. Dad is just lucky I don’t do it him. In fact, I think he’s jealous. Barks with puppy laughter! Do you do anything like this to your humans to keep them in line of who really is the boss of your crib? Now I leave you with Jokes with Daddy – enjoy and try not to cringe. Barks – hello my friends!! It’s so hard to find good help these days. My mom – rolls puppy eyes – she may never be caught up again in her life. She is so slow! I can’t wait for her to help me with my blog. So I grabbed the i-pad and Bacon and we got started this week by ourselves. 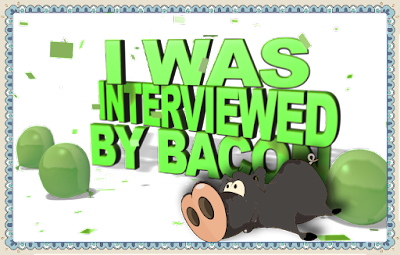 Bacon has been helping me and giving me lessons. He’s a good oinker – I don’t care what dad says – barks with puppy laughter. This week I want to give you my fellow anipals a helpful suggestion. I learned this when mom was down from her surgery and had to stay in the bed. Often times I would stay with her to make sure she didn’t get out of bed without assistance. But sometimes a dog has to sleep. So I did what I thought was amazing. I took my loudest squeaky toy Mr. Chicken and positioned him in the doorway of the bedroom. That way if mom tried to get up without me, she would step on Mr. Chicken alerting me to wake up and assist her. Clever huh? So that’s my tip this week my friends – position your squeaky toys like little bombs in your humans bedroom. They especially love it when they step on them in the middle of the night. Usually they jump from the squeak. For an old man, my dad can jump pretty high in the dark. Just sayin’. Speaking of dad, he is taking off this week researching new jokes. Can you believe that? So this week, I’ll leave you with a mom joke. You’re going to love this – barks! Have a great weekend! What do you call a nun in a wheelchair? Can you tell that this picture has a look of busted with it? Barks with puppy laughter. What? I was doing anything. Honestly. I was just having a heart to heart with my zebra toy. His tail wanted to be yanked. Yep. That was it. Would I lie? Don’t answer that okay. Barks with puppy laughter. This was how I spent my New Years Day – running around the house barking at my zebra. He never listens. We hope you have a wonderful New Years Day my friends. Now I leave you with Jokes with Daddy.